The SRL2 can be paired with up to nine other headsets for Bluetooth intercom conversation. 1. 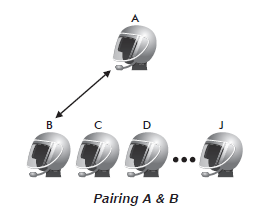 Turn on the two SRL2 headsets (A and B) that you would like to pair with each other. 3. Simply tap the Center Button of any one of the two headsets A or B (It doesn’t matter that you choose A or B.) and wait until the LEDs of both headsets turn to blue and intercom connection is automatically established. The two SRL2 headsets A and B are paired with each other for intercom conversation. If the pairing process is not completed within one minute, the SRL2 will return to stand-by mode.